Two strong threads of interest weave through Sally Fox's life as an innovator: a passion for natural fibers and textiles, and an equally passionate commitment to protecting and preserving the environment. It was the coming together of these two interests that led her to develop Fox Fibre®, the first commercially spinnable, naturally colored cotton. 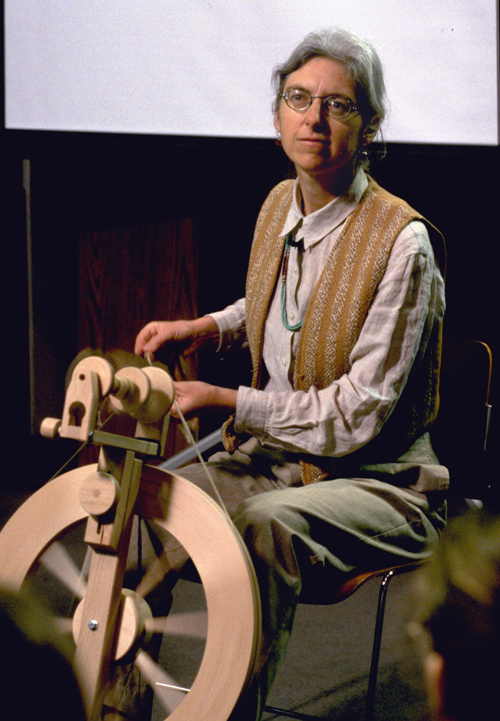 Inventor Sally Fox spins wool during an "Innovative Lives" presentation at the Lemelson Center in 1997. Smithsonian photo. In 1982, Sally Fox was working for a cotton breeder in California when she came across a bag of brown cotton seeds. The breeder was considering studying the insect-resistant properties of brown cotton. Fox was inspired to grow some brown cotton of her own, so she obtained some seeds and planted them in her mother's backyard. During 1982 and 1983, Sally Fox grew cotton in pots on the back porch of a rented apartment. She began crossbreeding the brown cotton and eventually planted the seeds in a friend's garden. In 1985, Fox leased a small plot of land and continued to cultivate her cotton. Eventually, some of the plants growing from cross-pollinated seeds produced green cotton as well as brown cotton. After ten years of hard work, Sally Fox's dream became a $5 million business. "I never really planned to be an inventor, but my attitude toward life has always been inventive," she says. On November 14, 1997, Sally Fox spoke with students from Jefferson Junior High School in Washington, DC, Ormond Stone Middle School in Centreville, VA, and Thoreau Middle School in Vienna, VA, as part of the Lemelson Center's Innovative Lives series. She was accompanied by her niece, Abby Person, who also has applied for a patent related to naturally colored cotton. (While still in high school, Abby discovered a way to alter and expand the range of natural cotton colors without using tints or dyes.) Sally Fox used slides and a video to explain selective crossbreeding, shared her plant data cards with the students, and hand-spun cotton on a spinning wheel as she answered questions and talked about science and invention. After meeting Fox, the students toured the Museum's Agriculture Hall, the "Engines of Change" exhibit, which features a section on 19th-century textile workers, and the Hands On History Room, where they learned more about cotton gins, spinning machines, and Navajo weavers. Two strong threads of interest weave through Sally Fox's life as an innovator: a passion for natural fibers and textiles, and an equally passionate commitment to protecting and preserving the environment. It was the coming together of these two interests that led her to develop Fox Fibre®, the first commercially spinnable, naturally colored cotton. Her work in cotton breeding, beginning with a handful of seeds in 1982, has grown into a prize-winning, 40-acre enterprise, Natural Cotton Colors, Inc., that has been featured in Forbes and Entrepreneur magazines and, more importantly, expanded the range of natural cotton clothing and home products available in the United States and abroad. As a child growing up in the San Francisco Bay area, Sally was fascinated by spinning and weaving. She saved her baby-sitting money to buy her first spindle—a drop spindle that she purchased at a Renaissance Fair—and would spin any fibers she could find, from the fur shed by the family's Samoyed dogs to the cotton balls used to pack medicine bottles. "In those days—this was 1969—they weren't selling spinning supplies, and I was in an urban area," where it wasn't easy to find natural materials, she explains. So devoted was she to this hobby that her parents presented her with a floor-model spinning wheel for her 13th birthday. As she developed into one of the top hand-spinners in the country, she fantasized about having her own hand-spinning business one day. Yet there was another strong influence in her life that changed her direction. It was the period of the Vietnam War, and the terrible effects of Agent Orange were making headlines. Rachel Carson's Silent Spring, an exposé of the damaging effects of pesticides, had recently been published. Sally read it, and at the age of 12 decided she wanted to dedicate her life to reducing or eliminating the use of pesticides. While retaining her interest in textiles and still enjoying spinning as a hobby, she turned to the study of science, getting a B.S. degree in biology from California Polytechnic State University, San Luis Obispo, in 1979, and an M.S. in entomology, specializing in integrated pest management, from the University of California, Riverside, in 1981. She was working as a pollinator for a plant breeder who was developing insect-resistant cotton when she first came across colored cotton seeds in 1982. Because of her background in spinning and her interest in textiles, she was immediately intrigued by their possibilities. Naturally colored cottons have always existed, and they were cultivated in the Americas long before Europeans settled here. The development of the textile industry helped develop a preference for white cotton. Although colored cottons, which come from a wilder background, are more pest-resistant than white cottons, which have been carefully bred for hundreds of years, they also tend to have shorter fibers. It is the length of the fiber that determines whether cotton can be spun on commercial machines. The fibers of most colored cottons can be hand-spun, but in their original, natural state they are not long enough for industrial spinners, and thus cannot be used for mass-produced textiles. "People didn't think it was possible to improve the quality of the brown and green cotton so that it could be spun. So because they thought it was impossible, they didn't really work on it," Sally says. "When I started my work, I was an entomologist, and I hadn't read all the plant books saying you couldn't do it. So I was blessed with ignorance, and thus went on. I also loved to spin those cottons!" In the 18th-century, when the industrial revolution began, there was tremendous interest in fabric dyes, and people were more excited about printing and dyeing white cotton than about weaving cotton in natural colors. Later it became apparent that many substances used in dyeing were highly toxic. Sally herself had a friend whose daughter, a teacher of textile dyeing, lost most of her brain function and was hospitalized for life as a result of exposure to too many dyes, which had seeped into her skin and poisoned her. This painful experience made Sally scared to work with dyes and strengthened her determination to develop naturally colored cottons with fibers long enough for commercial spinners. She started with just a few seeds, which she planted in her mother's backyard. The next crop was planted in flower pots on the back porch of a rented apartment. "The first three years, I grew my plants in pots as I moved around the state of California. Everywhere I went, the plants went with me," she recalls. She began a program of crossbreeding and progressed to a plot in a friend's garden. In 1985, she was able to lease a small field to expand her breeding program. Using classical breeding practices, Sally aimed to develop varieties of cotton with longer fibers and to increase the richness and range of colors available. At first, the seeds she planted yielded rows of cotton with diverse colors and characteristics. "It took me eight years of hard work to get to the point where there is a field of [cotton plants] that are all the same color of brown, and all the same height, and farmable (sic)...I started with plants that were all different heights...So a lot of what I breed is not just color, but farmability (sic)." The work is tedious, hot, and repetitive. California cotton farmers did not want colored cotton grown near their crops of white plants, because of an ungrounded fear of cross-pollination (cotton self-pollinates). So Sally Fox moved her breeding experiments to areas of Texas, New Mexico, and her present base of operations in Wickenburg, Arizona. The length and strength of cotton fiber varies from region to region, because it is related to the length of the growing season. Cotton thrives in areas with long periods of very warm or hot weather—miserable conditions for humans, but heaven for these plants. On her 40-acre farm, Sally raises hundreds of thousands of plants, carefully cross-pollinating them by hand. "Every year I do more cross pollinations, hundreds of them," she says, "because you constantly have to introduce new diversity from which to select." The varieties are planted in distinct plots, interspersed with beans to nurture the soil and sorghum to keep the cotton plots visibly separate. Each growing season, Sally inspects over 250,000 plants, noting the length of the fiber and other individual characteristics on record cards to determine whether or not to save the seeds. It takes three months every fall to walk through the plots and inspect each plant. During the winter, Sally analyzes the data, examines the spun fiber, and makes decisions. "Out of 250,000 plants I go through," she reports, "I save about 2,000 or 3,000. On these I take meticulous notes on the structure of the plant and the structure of the boll, and I also spin a small amount of the fiber and process it to see whether the color will increase or change in washing it. Some get darker and some get lighter. I only bring into production the ones that get darker." It takes seven to ten years of selective crossbreeding before a new variety develops. (A variety is a line of plants whose seeds always produce plants identical to the parent but distinctly different from others of the same species.) Since her initial experiments in the early 1980s, Sally Fox has been successful in increasing the average length of colored cotton fibers from about one-half inch to over one inch long, more than adequate for commercial spinning. She holds four plant variety protection certificates (the equivalent of patents for open-pollinated plant varieties) for types of naturally colored cotton, which she grows under the registered trade name Fox Fibre® in six distinct shades: Coyote and New Brown, both of which are reddish browns, milk-chocolate-colored Buffalo, sage-colored Palo Verde, Green Fox Fibre®, and a dark forest New Green. Sally also has received a utility patent for the flame resistant properties she discovered and bred in Coyote and Buffalo Fox Fibre®. The discovery came about simply by observing what happened when the discarded cotton plants—the "weeds" of different colors that were pulled out of otherwise homogenous plots—were burned: the brown cotton did not burn easily, but seemed to be innately fire resistant. The possibility of producing a safe cotton for children's sleepwear that did not require treatment by chemicals inspired Sally to pursue this discovery. She has been selectively breeding for fire resistance and continues to observe carefully for other advantages colored cotton may offer. Throughout the years she was developing her breeding program, Sally Fox supported herself and her research by holding a variety of full-time or part-time jobs. In 1989, she founded Natural Cotton Colours, Inc., which developed into a multi-million dollar business. Never losing her interest in textiles and spinning, Sally created samples of yarn from her cotton, and she gave the raw cotton to other hand spinners for testing and experimentation. She listens to and learns from her colleagues, and continues to design yarns and fabrics, which are often adopted by manufacturers of textiles and household goods. Fox Fibre® clothing and other products are now marketed internationally by companies such as L.L. Bean, Eileen Fisher, and Fieldcrest. Fox Fibre® can be found in products ranging from underwear and bed sheets to luxurious cotton velvet upholstery fabric. Natural Cotton Colours, Inc., now has two full-time employees, two part-time workers, several full-time farm dogs (two of them named Eli and Whitney), and contracts with other farmers to grow Fox Fibre® cotton. Yet staying in business is always a struggle. "Sometimes I make good money, and that's what I use my money for, the breeding program. And at other times we have a very hard time...It's often very difficult for a scientist/inventor to have good business skills. And I have some business skills, but it never seems like it's enough. It's a challenge." While pursuing her crossbreeding experiments and running her business, Sally has never lost sight of her life-long goal: to protect and preserve the environment. She has been a pioneer and proponent of organic farming methods for cotton, and her influence has been considerable. In 1988, there was only one acre of organically grown cotton in this country; today there are over 20,000 acres of organic cotton. Sally's remarkable achievements have been recognized by numerous environmental organizations. Awards and honors she has received include, among many others, the 1993 United Nations Environmental Programme Award for the Environment (for "leadership in protecting the earth" and "acro-ecology innovation"), the Discover Magazine 1994 Discover Award for Technological Innovation - Environmental Category, and Good Housekeeping's Green Housekeeping Award for Environmental Leadership. Sally Fox was also a "spotlighted candidate" in the 1995 Lemelson-MIT Prize program, administered by the Massachusetts Institute of Technology. Sally did not come from a family of inventors, and she learned about plant breeding, plant variety protector certificates, and patents largely by asking a lot of questions. To be an inventor, one must have an inherent interest in problem solving, discovery, and understanding how things work. Observation, openness to the ideas and suggestions of others, and continual questioning are essential, she believes: "What is critical is to retain an openness and a questioning approach to life in general...I never really planned to be an inventor, but my attitude toward life has always been inventive."